So You Can Get On The Right Road To Financial Freedom! I learned that a solution exists for every IRS tax problem without hiring tax relief attorneys . In this post, I provide you information about IRS tax relief programs that can provide you a Fresh Start that many Americans are unaware of. Most people don’t go around bragging about their IRS problems. But that doesn’t mean they don’t exist. Owing back taxes is way more common than you think with the number of delinquencies continue to go up while the ability to pay is decreasing. According to Michael Rozbruch, a recognized entrepreneur and the founder of Michael Rozbruch’s Tax and Business Solutions Academy™, RozStrategies.com/ more taxpayers have IRS tax debt right now than ever! 14 million taxpayers are in the IRS’s collection division that have a tax debt large enough to call for professional representation. 19 million people owe the IRS $391 billion right now. It is very important that you don’t ignore an IRS issue and hope it will go away. The IRS will catch up with you and the penalties, interest and the fines will have only grown bigger! If you are one the 19 million people who owe the IRS back taxes, check out these 5 IRS tax debt relief programs aimed at resolving various tax problems (without hiring an IRS tax lawyer). Grab one of a few NO COST consultations with TheCPATaxProblemSolver to see if you qualify for any of these IRS tax help programs following this link bit.ly/BookCallWithTheCPATaxProblemSolver. This is one of the IRS tax relief programs that gets the most attention because it really gives you the best chance at a Fresh Start. 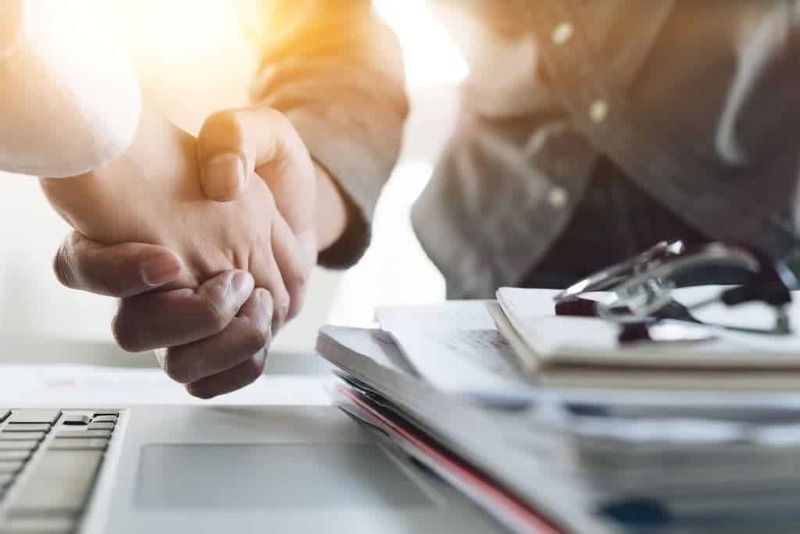 An Offer In Compromise is an agreement between you and the IRS and the settling for an amount less than the full amount owed. It is an option for those who are not able to pay the past due amount in full, or if paying the full amount will cause a financial hardship or leave you in a state of financial distress. To qualify for an OIC, you must have filed all past tax returns & must be current with federal tax withholding or estimated tax payments for the present year. When an OIC is approved by the IRS, there are two payment methods available. The first is a “Lump Sum” in which you pay the offer amount in one lump sum or in a payment installment of 5 or fewer payments within a set period of months. The second is a Periodic Payment Offer in which payments are made in 6 or more monthly installments and must be paid within 24 months. If the IRS agrees to the OIC, you are required to timely file and pay all future taxes over the subsequent five years. If you do not abide with the set terms of the OIC, the IRS may consider the OIC to be in default. In this event, the OIC is null and void and the IRS will demand immediate full payment of the original tax balance plus penalties and interest. When you cannot pay your tax debt in full immediately, you might be able to set up a monthly payment plan or Installment Agreement (IA). If you agree to pay the full amount, you may be able to reduce the interest owed and any other fees. Folks may be eligible for an online payment plan if you owe less than $50,000 in combined individual taxes, interest and penalties. You must have filed all of the necessary tax returns. You must also make the minimum required payment by the set due date. Any future tax refunds will be applied to your debt until it is paid in full. After the penalty has been assessed, you can request a penalty abatement via a written letter to the IRS. Once the penalty has been paid, you can request a refund using Form 843. However, you must file this request within 3 years of the return date or within 2 years of paying the penalty. As a great deal of married taxpayers opt to file a joint return, this filing status leaves both partners liable for any taxes, penalties, and interest due in the event of a divorce. However, the spouse who feels they are being wrongly held liable, may file for “Innocent Spouse Relief” in the event that one of the involved parties failed to report any income or claimed false credits or deductions. There are erroneous items on your joint return. You can prove that you did not know there was an error on the form at the time it was filed. Should you and the IRS agree that you do owe the amount in question, but you are unable to pay in full due to your financial situation, you may be able to apply for Currently-Not-Collective (CNC) or Financial Hardship status. In order to qualify, the IRS must determine that you cannot pay your cost of living expenses and your taxes at the same time. When your necessary living expenses exceed your monthly income, the IRS will approve your CNC request and will not try to collect any past debts or issue any levies against you while you are in CNC status. However, the IRS has the power to add interest and penalties during that time, as well as to withhold any pending tax refunds and apply them to the amount owed. 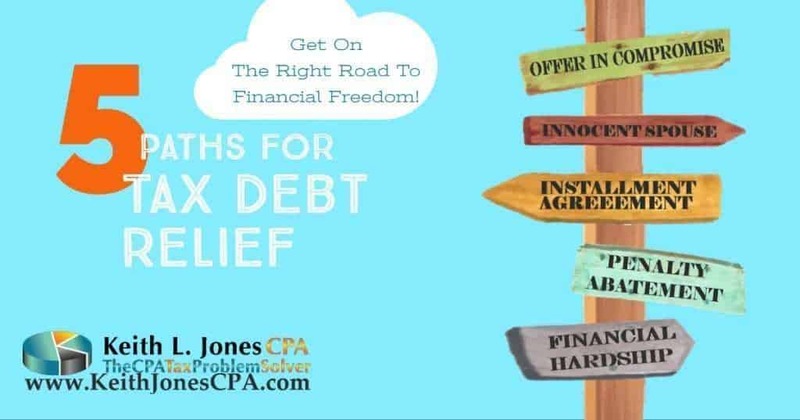 Call Keith Jones, CPA TheCPATaxProblemSolver toll free TODAY at 844-888-1040 to determine if you are eligible for a Fresh Start and get on the road to financial freedom! You Will Sleep MUCH BETTER TONIGHT! Should You Hire Your Kids? Nurture Your Child’s Entrepreneur Spirit While Building Your Family Legacy at the same time. As long as they’re doing legitimate work for your business, you can hire your kids and pay each of them up to $12,000 per year tax-free. IT’s true. And all of this while they earn a little money AND start saving for college or that first business. And it’s all tax-free. As long as they’re doing legitimate work for your business, you can hire your kids and pay each of them up to $12,000 per year tax-free. If you hire your son to stuff envelopes and your daughter to update your website then you get to lower your personal income by $24,000! Simply by engaging your children in the family business. If they stay under this limit, they don’t even have to file a tax return, which means they don’t pay any income tax on it. And you get to deduct their wages, which lowers your business’ taxable income. Each of your children can be employed by your business and paid an annual wage of $12,000. This is an important amount, because it is the standard deduction amount for single individuals. Your business gets to take a deduction for the payment, thus decreasing your taxable income. Your children will then file their own tax return, & since they only made $12,000 they pay no federal income tax because the standard deduction of $12,000, their taxable income is ZERO. So the business gets to take a deduction, but the kids pay no federal income tax. It does not get much easier than that! This strategy can also be combined with IRA and 401k strategies to really maximize the benefit. For instance, if you paid each child $12K each as salary. You could put $6K into an IRA that is deductible, and you can use their standard deduction to take their taxable income to zero. In that case, your business can deduct $18K per child, but again, no taxable income. If you want to save money then hire your kids and make sure you have them actually work! Keep track of the hours and tasks your children perform and make sure it’s age appropriate. DOL Rules Regarding Youth & Labor The IRS isn’t going to believe your 5 year-old earned $12,000 analyzing dental records. But that 5 year-old can model those pearly whites in photographs to be used on your website or brochure! It’s easy to document an “image agreement” that pays an ongoing licensing fee right from the start. Using this strategy, rather than just dumping change into their jar, (money you likely paid personal taxes on) you’ve moved those taxable dollars from your tax rate, to your child’s tax rate and bracket, which, is zero, and you still keep the money in the family!. There are countless jobs kids can do for you, and remember, you can pay them at the SAME RATE you would pay any other employee or outsourced company. For more tax saving tips check out our blog!. Then put on your HR hat,because you’ve got some little new hires to train!